3M Medipore Soft Cloth Surgical Tape from HealthyKin.com is a latex-free, hypoallergenic soft cloth tape product that offers excellent adhesion yet is gentle to reduce risk of skin irritation. It is a non-woven polyester, soft, highly conformable tape. 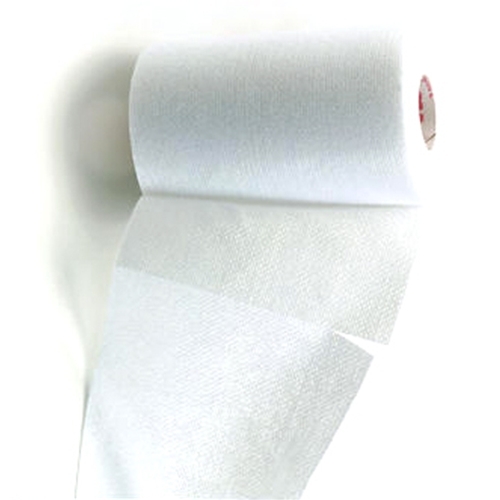 3M Medipore Soft Cloth Surgical Tape is comfortable, porous and breathable. It stretches to accommodate swelling and movement. The tape is perforated so that no scissors are required. It is easy to handle, with or without gloves, without curling edges, or sticking to itself. Medipore tape is particularly useful for securing wound dressings, tubing and catheters, and repeated applications where preservation of "at risk" skin is critical. Exactly what we were looking for and it what they used in the hospital. Best price we found online and extremely fast shipping!! We now only use this website for our medical supplies because of the quality, price, and shipping. The tape can be torn at 2 inch lengths or if you need longer it also tears easily at any size. It sticks well any doesn't tear skin as some adhesive tapes. When I ordered the 2 x 2ft the tape worked very well, but when I ordered the 2" x 30" the tape barely stuck at all. The only surgical tape you'll ever need. Very easy to use tape and very speedy shipping. great tape at a great price!!! The tape is great!!!! It's all I can use!!!! !